When nothing else seems to work, Renew Life Ultimate Flora Critical Care DOES! 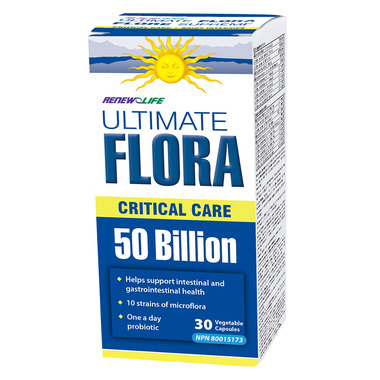 Ultimate Flora Critical Care’s blend of 50 Billion active cultures from 10 different strains in a ‘once a day’ serving helps ensure a healthy microbacterial environment in the intestinal tract. Directions for Use: Adults, adolescents and children 6 years and older: Take 1 capsule per day, approximately 2 hours after food. I had a lung infection and was on antibiotics which caused all kinds of gastric issues even after the antibiotics were finished. I experienced a noticeable improvement right away. Arrive home from overseas with fierce diarrhea, gut pains, foggy mind, muscle loss and a host of other side effects. Tried doxycycline and later tetracycline for weeks which gave some improvements but the problems returned a few days after completion. On a Thursday morning I picked 50 billion Ultra Flora, took one about 11 AM and by evening was beginning to feel much better. 3 days later all symptoms were gone with almost normal stools appearing. By 5 days stools were back to their old standards. THANK YOU, Ultimate Flora, my new travel companion. Recall, needs refrigeration. TrÃ¨s efficace, et moins cher que le Bio-K! Good product. I also like the 100 Billion probiotic. Helps with bloating and indigestion. Make sure you refrigerate if you want them to stay good. Wish I would have found this product sooner! I've suffered from IBS-C symptoms since I was very young. I have tried so many things to become regular (even Align). I have started taking one of these probiotics daily and the difference has been amazing. They have worked better than anything else I've tried- Well worth the money spent! Awesome probiotics. A variety of strains and a high count make for happy tummies! I have IBS and problems my whole life. I feel so much better, regular, no bloating or cramps! I have mild digestive issues; nothing too serious, but not as healthy as should be. Within a week of taking these I was "regular" again. Experienced a lot less bloated days when I take these. These really help to keep stuff moving along in the digestive system and keep it functioning as it should.